SHALOM - The consoling peace of the word of God for restless souls. 8.15 PM - Prayer & Benediction. 8.00 PM - Prayer & Benediction. 01.00 PM - Prayer & Benediction. 01.15 PM - Lunch & Departure. 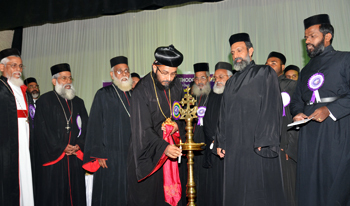 Meltho 2011 - the sixth annual three day convention of the Orthodox Parishes of Bangalore was held from 11th to 13th Feb 2011 at the Campus Crusade for Christ Auditorium, Lingarajapuram, Bangalore. 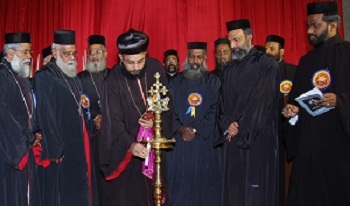 All the priests & Vicars took a keen interest and participated along with members of the respective parishes. Transport arrangements had been made from all parishes to the venue. A phenomenal number of devotees attended the convention on all three days & was supported by extensive media coverage. 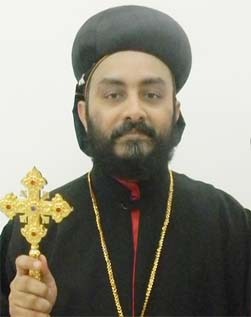 Bangalore Orthodox Bible Convention – MELTHO (meaning “the Word”) is organised annually over three days by the Orthodox Christian Parishes in Bangalore to enrich the cardinal virtues associated with Orthodox faith and belief. The main agenda is Group Bible Study, worship and intercessory prayers. The message of love and care, mutual respect and tolerance contained in the Christian Gospel are disseminated in lectures and corporate worship. The convention aims at entering areas of social service and charity.